The Mediterranean theme continued through the next course, a round tranche of swordifsh wrapped in serrano ham and thinly sliced eggplant, served with a panoply of accompaniments: caponata, grilled baby zucchini, a tempura-fried zucchini blossom, delightfully crispy-shelled croquettes, and a ruddy, saffron-infused tomato vinaigrette. The swordfish was delicately cooked, with just a faint blush of pink at the center. The caponata let each component - eggplant, tomato, onion, plumped raisins - be known while still making the point of their combined effect. 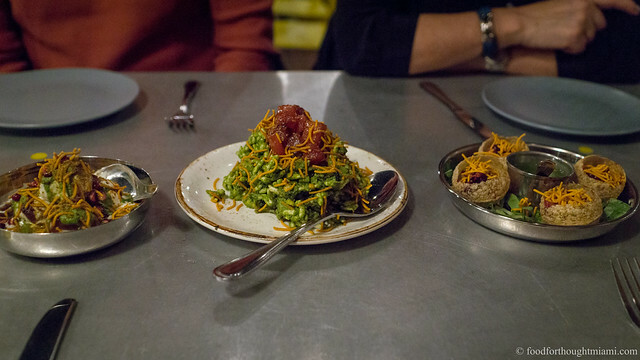 And the saffron vinaigrette pulled each of the dish's pieces together, that faintly spicy floral note weaving its way through the dish. For those who did the pairing, the bright, zingy Alsatian Riesling from Albert Mann (Cuvee Albert 2009) was a great companion to the dish, its acid and spice playing well against the fish and its companions. 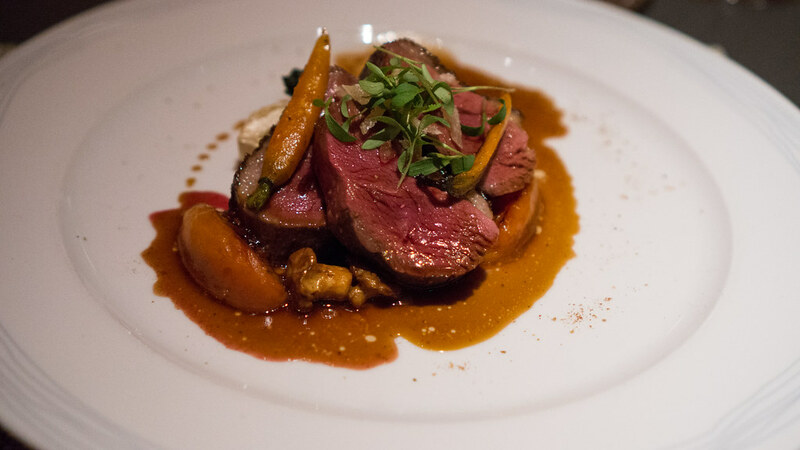 The next course pushed even further along the spice route, pairing hickory-smoked, rosy-fleshed duck breast with caramelized ginger and a sprinkling of ras el hanout, together with sweet, fragrant caramelized apricots, baby carrots and little mushrooms. Not in the picture, and served mid-course off of silver platters, were plump pastillas stuffed with confited duck leg and pine nuts wrapped in flaky filo dough - a smart and tasty addition to the North African theme. A smoky, oaky modern-style Ribera del Duero from Matarromera (Crianza 2008) went well with the smoked duck. 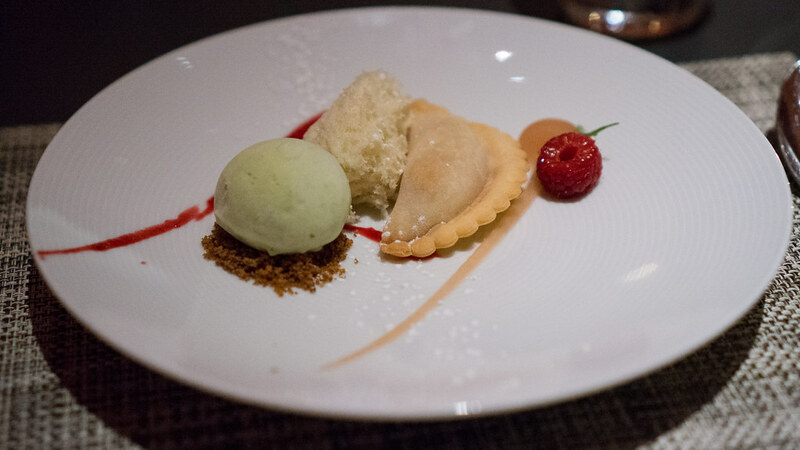 The floor was then turned over to DB's pastry chef Jerome Maure, who opened with a pre-dessert featuring a peach-filled empanada coupled with a fantastic Thai basil ice cream. The ice cream reminded me of the vividness and focus of flavor in the ice creams at Arzak - in particular, the great basil ice cream paired with chocolate orbs and a berry sauce for the sopa y chocolate "entre vineñedos". 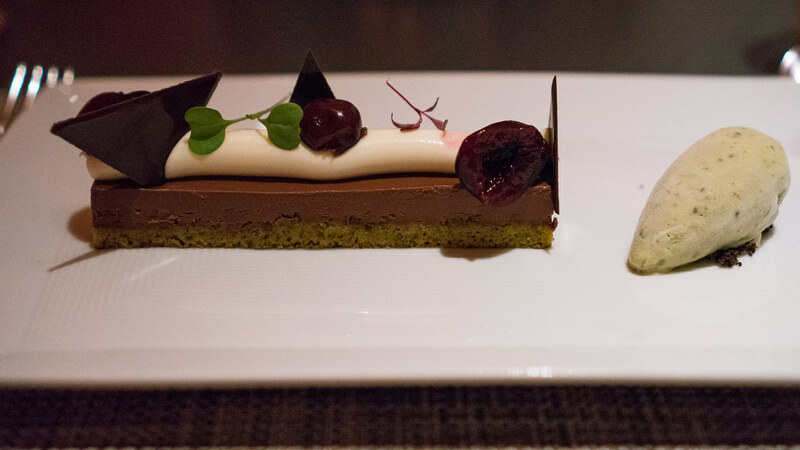 Next he offered a contemporary take on a classic "black forest cake" - here done with a layer of pistachio biscuit (that would be French bis-quy, not Southern bis-kit) topped with chocolate cremeux as the "cake," a ribbon of soft white chocolate ganache in place of the whipped cream, topped with tart-sweet poached fresh cherries. The light textures were a welcome contrast to the typical leaden thud of a dense black forest cake. The meal ended the way I prefer to conclude all my meals at DB - with a basket of their warm, airy, sugar-dusted madeleines. 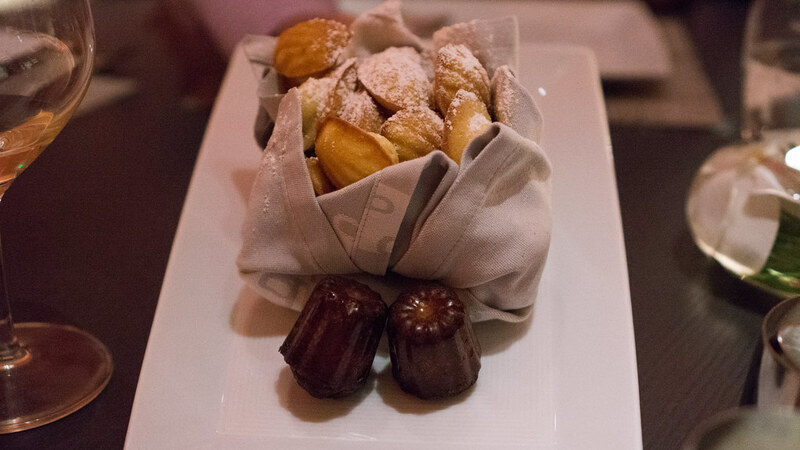 As an extra little bonus, a couple mini canelés were also riding sidecar. 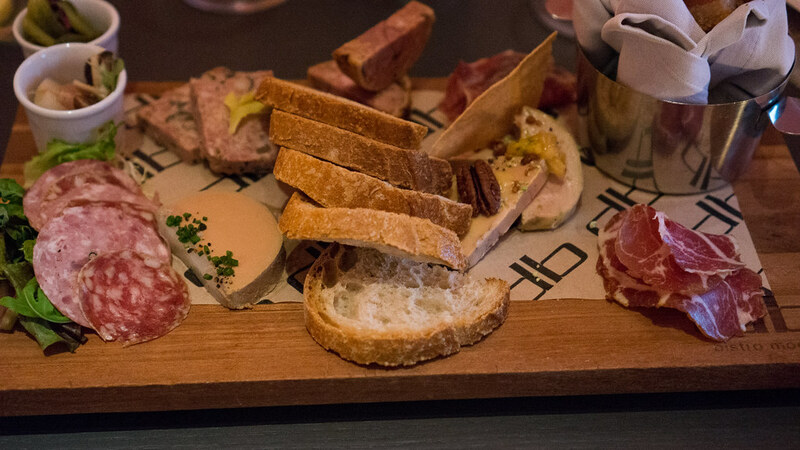 Godard and crew delivered one of our most elegant and classy Cobaya experiences, the kind of meal that is exactly what you would expect a Boulud venue to deliver. 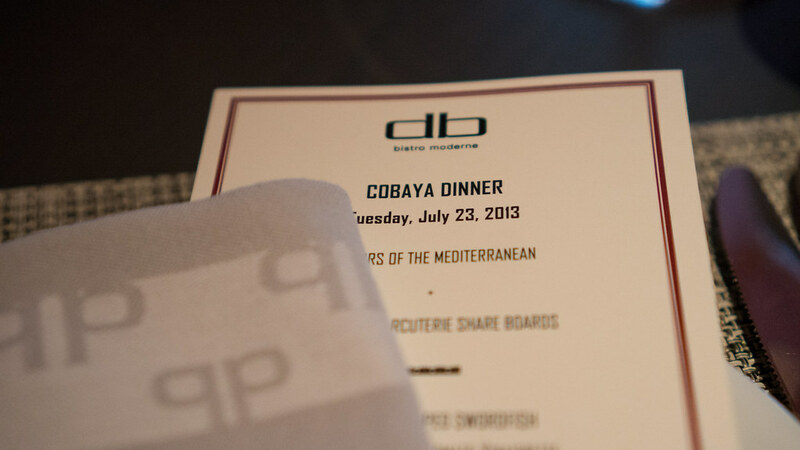 And that, in its way, is both compliment and critique: for while the dinner was very much "DB" - and very good - to me, anyway, it was not quite as much "Cobaya." 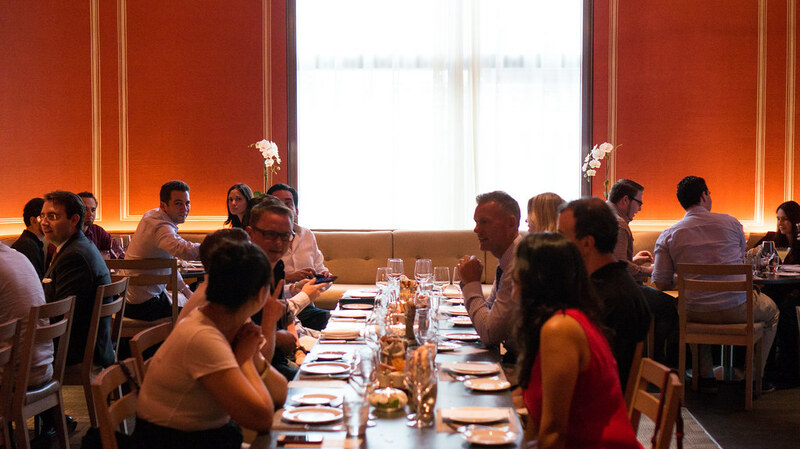 This is an open-minded audience, and we see it as an opportunity for a chef to go "off-script" - but that may be easier to do at some places than others. Still, it was an excellent dinner, and I'm tremendously grateful to all of the crew in the kitchen and front of house at DB Bistro for hosting one of our experiments; and as always and most of all, many thanks to the guinea pigs whose interest and support makes these experiments possible. The pacing and progression of the meal and wine pairings were a bit odd. 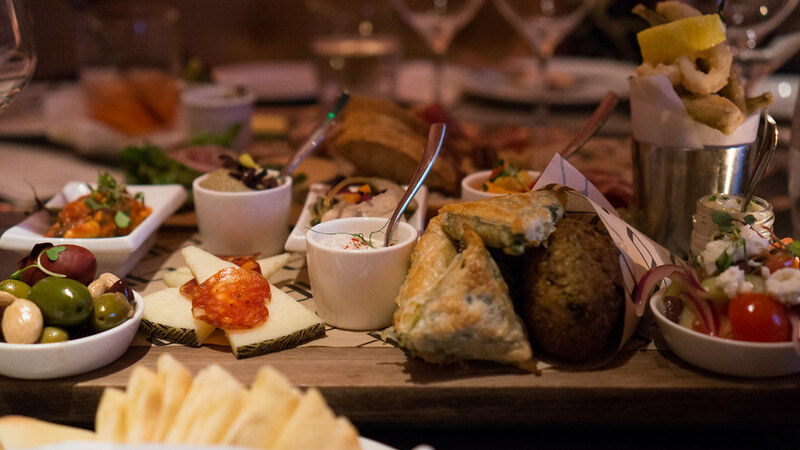 The charcuterie and "Flavors of the Mediterranean" platters were somewhat slow to the hit the tables, then at many tables ended up nearly piled on top of each other - and no wine was poured with either of them. But when they did pour wine with the following courses, they were quite generous, repeatedly doing the rounds to top off glasses. 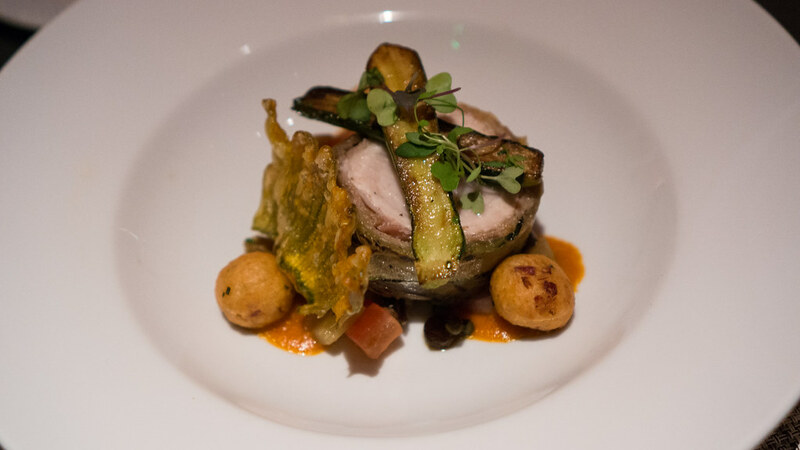 Also, the swordfish, followed by the duck, both substantial portions, felt more like two main courses than a tasting menu.